Obituary for Jean Marie Lesman | Langeland Family Funeral Homes, Inc. Went to be with her Lord and Savior, Tuesday evening, March 13, 2018. Jean was born September 8, 1932 in Kalamazoo the daughter of Merle and Ethel (Weicher) VerHage and had been a lifelong resident in the Kalamazoo area. On June 2, 1951 Jean was united in marriage to her loving husband of nearly 67 years, William "Bill" Lesman Jr. who survives. She was employed for a short time with Allied Paper. In early years, Jean and Bill were members of and actively involved at Southridge Reformed Church, then Westwood Baptist Church; and most recently attending Berean Baptist Church. They enjoyed teaching Sunday School at these churches, along with Stockbridge and Portage First Methodist. 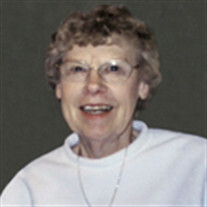 Jean was involved with the Christian Women's Club and completed her service as Chairman. She was also involved with Stonecroft Ministries in Missouri. Jean taught wildflowers, embroidery and various other crafts with 4H and enjoyed playing bocce ball. She especially enjoyed playing games with her grandchildren and family. Surviving besides her husband, are her children, Judith (Stephen) Cesler, Deborah (David) Kolmodin, William Robert (Annie) Lesman, Carol (Steve) Guzdial; 15 grandchildren, Joel (Kathryn) Kolmodin, Timothy (Stacey) Kolmodin, Kimberly (Elwynn) Martin, Melodie Kolmodin, Benjamin Lesman, Samuel Lesman (Alyssa Fenner), Bethany (Ryan) Ratliff, Michelle (Stephen) Besson, Christie (Matthew) Peterson, Andrew Guzdial, Elizabeth (Philip) Glotfelty, Christina (David) Guerdan, Hannah (Kevin) Lopez, Sarah (Gavin) Whitman; 12 great-grandchildren; a brother, Robert (Marva) VerHage; and several nieces and nephews. Jean was preceded in death by several brothers and sisters-in-law. Friends may meet the family Friday evening, March 16 from 6-8pm at the Langeland Family Funeral Homes, Portage Chapel, 411 E. Centre and one hour prior to the service at church. Services will be held at 11:00am Saturday, March 17 at Berean Baptist Church, 7813 South 12th Street. Interment will be in Mt. Ever-Rest Cemetery. Memorials may be directed to St. Jude Children's Hospital or Berean Baptist Church.